Looking for a unique mobile caterer? 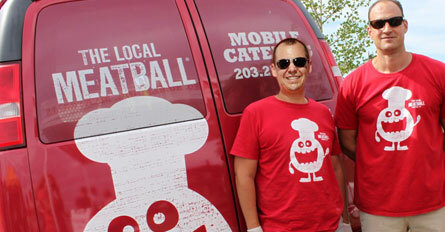 Whether you are hosting a birthday party, corporate event, bar/bat mitzvah, rehearsal dinner, festival or another special event, you need look no further than The Local Meatball food mobile catering cart. To date the cart has served party guests in backyards, next to swimming pools, on decks, in garages, golf courses, on boat ramps and yes, an airport hangar! Book a party and just tell us where you’d like to serve your guests. We’ll make it happen and give your party some balls.